Did you ever wonder what the P. in Bernard P. Fife stands for? Well, it just might be for Pillow. 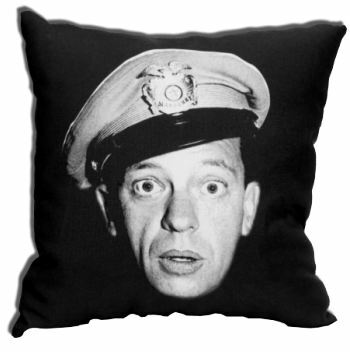 Then again, it might not, but there's no doubt Barney would love this pillow. It measures 14 in. x 14 in. and is made of light weight cotton canvas Look & Feel The filling is blown & closed 100% polyester. The design's on the front and back. It's a throw pillow, but that doesn't mean you have to throw it. That is, unless your name is Bass and you just can't resist. And even then, windows are probably safe, though we offer no warranty for that and instead recommend using it just for decorating and resting.